A therapist recently suggested the use of a talking globe for family discussions. This reminded me of the family intervention scene with the talking pillow in the TV show Breaking Bad. 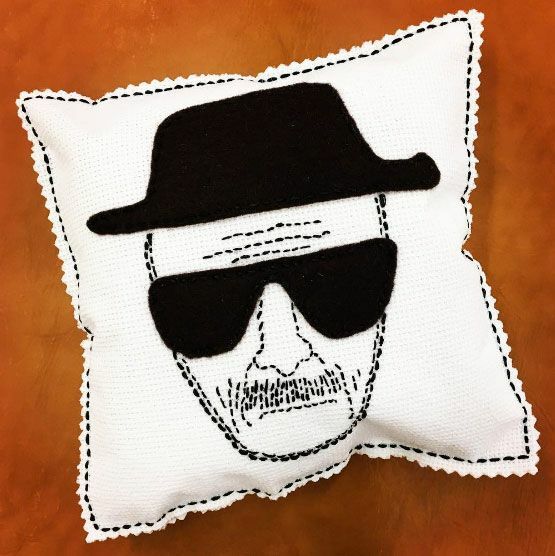 In my immediate family we are all fans of the show and I thought it would be funny to make a talking pillow and have a portrait of the main character Walter White aka Heisenberg on it. That should create a more convivial atmosphere for us. I feel a little silly making fan art at my age but if I call it Pop Art it’s more legit, right? I traced a drawing of the character at the size I wanted onto translucent tracing paper. I decided to applique felt onto the dark hat and sunglasses areas so I used my tracing to make additional outlines for the hat and glasses on scrap paper. I pinned the scrap paper to the felt and cut the shapes out. Another method for transferring a shape design to felt is to make a chipboard template and trace around it with a ball point pen or graphite pencil for light colors or a light colored chalk pencil for dark felt colors. Next I cut out two square pieces for the front and back of the pillow from scrap knit white fabric with a texture to it that was suggestive of cross stitch backing fabric. I ironed fusible webbing onto the backs of each piece because stretchy fabric like this knit is sometimes hard to keep square. I pinned my tracing to the front of the pillow and fastened my felt pieces in place over the sunglasses and hat areas. 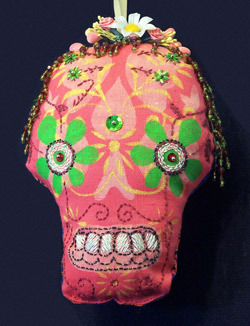 I stitched the felt pieces around the edges with black embroidery thread to hold the applied pieces in place. I then stitched the rest of the design with two different weights of embroidery thread through the tracing paper. When I was finished stitching I carefully tore the tracing paper away. In places where the stitching was close together I used a pair of tweezers to tear out some small remaining tracing paper bits. I pinned the pillow halves together with the good sides facing out since I was not planning to turn the pillow inside out. I stitched the halves together with more of the black embroidery thread leaving a gap at the bottom edge for stuffing. I stuffed he pillow with fiberfill then sewed the gap shut. The last step to finish the pillow was to trim the raw fabric edges with pinking shears. I’ve been working on some prototypes for cuff bracelets made from upcycled fabric, ribbon and faux leather. I’ve had a lot of fun stitching ribbon to tubes made of fabric and pieces of faux leather. I’m embellishing some with beads and buttons. My next step will be working out how to finish the backs and attach snap fasteners. So much fun!